Why clamato, you ask? Mike and I actually came up with the idea one evening walking home from the grocery store, having bought a jug of clamato juice. I was wondering what to make after Piña Colada, and Mike thought Clamato would be another excellent cocktail to crochet! 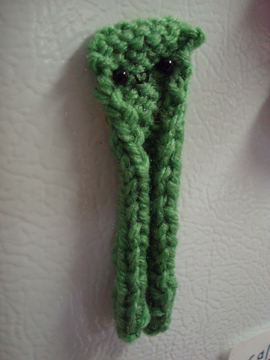 So, I have been wanting to crochet Clamato for a while… and for the 100th post I thought adding celery would form the number “100”, with Celery being 1 and Clamato being the two 0’s. They tried, but numbers aren’t their best suit, so they requested some Photoshop help. how do we look now? more like 100? 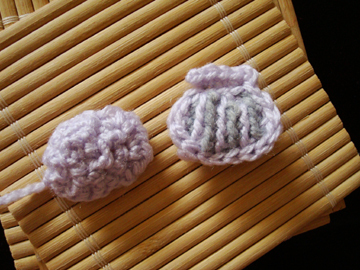 I made them yesterday while participating in the Make‐a‐Long hosted by Leethal. I participated in the first Make‐a‐Long back in spring, about the time when I first started genuine mudpie, so I thought participating in it again would be the perfect way to celebrate post no.100! So! The morning of the Make‐a‐Long was pretty much spent trying to figure out how to make Clam. Clam is not as simple as he looks. Or maybe I just don’t know how to do this in an easier way. 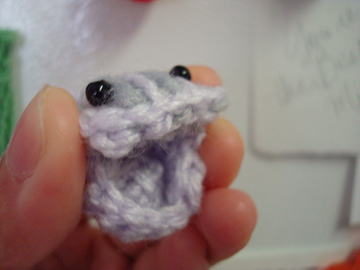 I found a lovely lilac and a grey that seemed perfect for a clam shell, and I wanted to make ridges on his shell with slip stitches, all going in one direction. That means all the rows had to be worked on the right side. 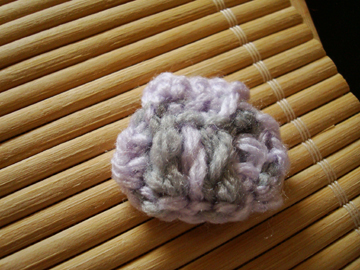 It took a few tries to figure this out, but it all worked at the end :D So, at around 11am‐ish, I had the top and the bottom of Clam finished. 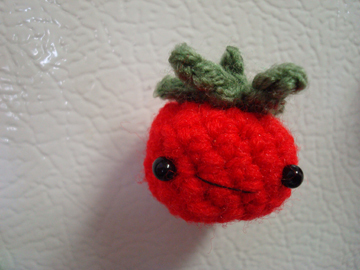 I then quickly finished Tomato. 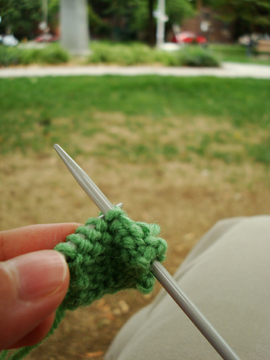 After lunch Mike had a meeting so I decided to go with him and knit in a nearby park, because I don’t go out much these days and change of scenery is refreshing. 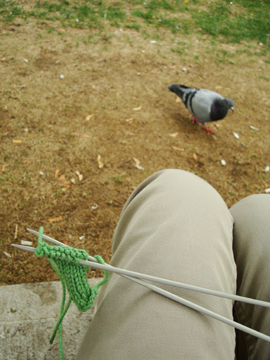 Visited by one of many pigeons. 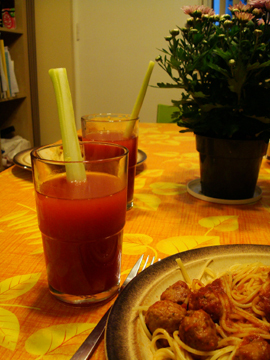 Then we went grocery shopping and bought clamato juice :D along with other grocery items. Mike kind of made‐a‐long by cooking meatballs a la Jamie Oliver. 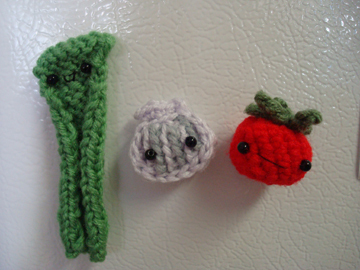 And then I attached the magnets on Clamato and Celery, and here they are on the fridge! Young Tomato and his signature lopsided smile. … until you squeeze his cheeks and he lets out a scary laugh! 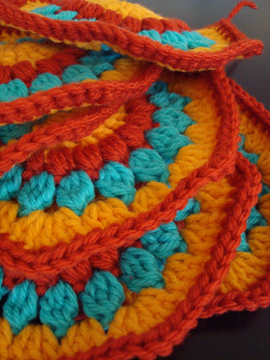 And then in the evening I worked on some fiesta granny hexagons for another project. I love the colour combination! 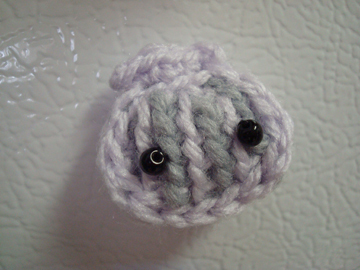 All in all I had a wonderful crafty day. 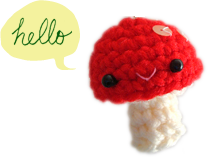 I’m thankful for the Make‐a‐Long, and a big thank you for visiting me on genuine mudpie! Hopefully there will be hundreds more posts to come! Congrats for the 100th post! I love reading them!! !